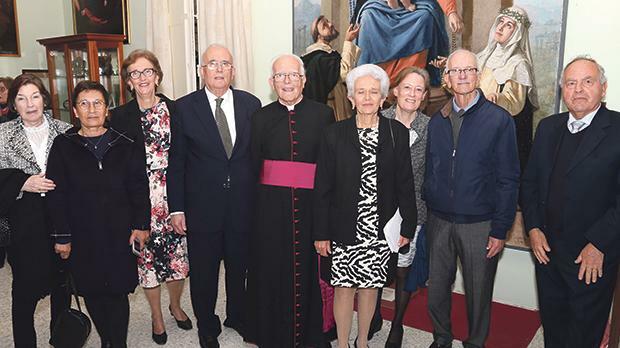 Mgr Said Pullicino (centre) pictured with his surviving siblings Joseph, Louis, Maryanne and Margaret, their respective spouses, and Lizette, widow of his brother Philip. Mgr Arthur Said Pullicino marked his 60th anniversary of his priestly ordination with a solemn concelebrated sung Mass at Stella Maris parish church, Sliema, on March 19, Solemnity of St Joseph. The Jubilate Deo Choir performed during the Mass during which various members of the Metropolitan Chapter and other priests joined Mgr Said Pullicino in thanksgiving and prayer. At the end of the celebration, the Archpriest thanked Mgr Said Pullicino for his sterling service to the Church in Malta, and presented him with a gift. The Mass was followed by a reception at the parish centre. Born in Sliema in 1935, the eldest son of John and Elda née Pace, Mgr Said Pullicino was ordained priest at St John’s Co-Cathedral by the late Archbishop, Mgr Michael Gonzi, in 1959. He obtained his doctorate degree in Canon Law from the Pontifical Lateran University and served as Judicial Vicar for the Metropolitan Tribunal of the Archdiocese of Malta until 2015. He has been a member of the Metropolitan Chapter since 1994 and is currently also the president of the Inter-diocesan Liturgical Commission.